Giving a toast at an engagement party can be a wonderful way to recognize a new couple's commitment to one another and to welcome a new family member with love and support. At the same time, however, a toast can be a delicate matter and must be handled carefully to avoid any embarrassment or hurt feelings. Who Toasts at an Engagement Party? Anyone can offer up an engagement toast. However, there is etiquette regarding who customarily offers up the first toasts. Parents: At one time, this role was usually reserved to first the father of the bride-to-be, followed by the father of the groom-to-be. Today both the mother and father of the future bride and groom can offer joint or separate toasts. Siblings: The brothers and sisters of the couple toast next. Grandparents: Grandparents may offer a toast. Some people have the grandparents toast before siblings. 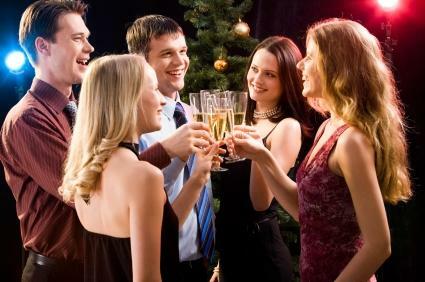 Close Relatives: Close relatives such as special aunts, uncles and cousins may offer toasts after the immediate family. Best Friends: Best friends of the couple can toast after the family. If the best man and maid of honor are already selected, they should toast before other close friends. However, at this early stage the wedding party is usually not yet officially chosen. Other Friends: Any friend can wish the couple well after the family and best friend complete their toasting. All toasts for an engagement offer the newly engaged couple support and happiness for the future. The toast usually fits one of five different types of toasts. General congratulations: The main message of this toast is a simple congratulations to the couple. Well-wishes: The toast expresses a wish for future happiness and blessings. Poetic: The poetic toast contains a short poem or a line from a poem. Quotation: A short quote about love and marriage is also appropriate for a toast. Story: A short description or story about the couple falling in love and their compatibility is also suitable for a toast. Engagement parties are the perfect opportunity for congratulatory toasts, but a toast should be given carefully so no offense is given to any party guests, including the happy couple, their parents, or other friends and family members. Choose any drink to toast with. Champagne or wine are celebratory drinks but may not be appropriate at an informal party - soda, punch, or even water can be used for a toast. Limit the speech to only one or two minutes. Longer toasts can become repetitive or boring. Speak slowly, clearly, and with enough volume so everyone can hear the toast. Standing will make your voice carry more easily. 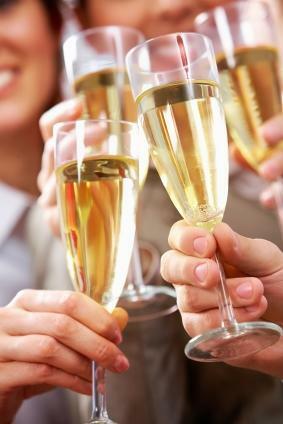 Keep the toast friendly, supportive, and informal, depending on the level of the formality of the engagement party. A more formal party will require a more formal toast, but an overly formal speech may seem more like a wedding toast. Avoid off-color or private jokes that may be misinterpreted or inadvertently cause offense. At the end of the toast, raise your glass slightly and sip, don't gulp. Making a toast is a perfect way to congratulate a happy couple as they take steps toward their happily ever after. A well thought out, heartfelt toast can be encouraging, welcoming, and loving, and those feelings will stay with the couple long after their wedding day.